Were you ever unfortunate enough to have a friend who liked Long John Silver’s? You may have been able to finagle your way out of a trip to the place the first or second time he asked you to go with him, but you know that custom and friendship dictates that the third time you will probably find yourself sitting amongst kitsch fishing paraphernalia in a dining room which seems covered in a perpetual dew of grease. If you’re anything like me, you have to take the rest of the day off of work in order to burn your clothes and flay your skin in an effort to rid your body and poor, tortured nostrils of the reek of the place. After that trip you believe you’ve done your duty as a friend, right? Once is all that it really takes, right? No? Well, then the next time you anticipate the Long John Silver’s dining request by wearing your worst clothes and requesting time off from your boss prior to the descent into perdition. After the second trip you’ve definitely paid your dues, right? Twice pays all, right? No? Okay … then you gotta give up the friendship. There’s only so much a body can take. Right? That’s how the choices of life feel sometimes, isn’t it? You find that it’s a choice between hurting your sister or your brother; your boss or your subordinate; your son or your daughter; your friend or your cousin. Or, it’s a choice between paying rent or feeding your kids; paying your electric bill or buying medicine; paying for gas to get to work or books for the school you’re attending so that you can escape those either-or, least-worst choices. That’s a pretty foul state of life if you ask me, however it’s one with which nearly all of us can relate. The example I’m giving is certainly prevalent amongst everyone physically, but it is pretty much every day of every spiritual life for someone who doesn’t have God. Spiritually speaking, for someone without God everything in life ends up being a choice between bad, worse and worst. After a few years of least-worst choices the pile-up of life-refuse gets a tad irritating. After a decade it becomes maddening. After a lifetime it induces insanity. 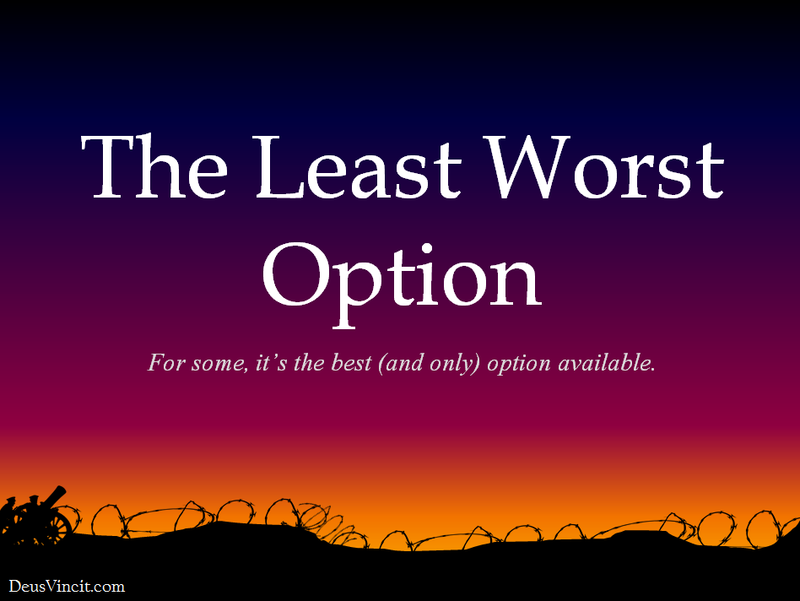 It’s no wonder that, with least-worst choices the only choices available to so many, our world is rife with drug abuse, broken relationships and poverty. It’s no surprise that suicide and abandonment is so wide-spread, when the other choices seem just as bad and hopeless. No, I’m not saying any of that to excuse choices which shirk responsibility or which perpetuate the degradation of the value of life or the obligation to care for one’s family. I am just saying that when you get backed into a corner – real or perceived – you tend to act rather irrationally. As life’s non-choices stare you in the face, fear brings out an anxious suspension of sanity and the next thing you know you’ve chosen what you thought was the least-worst option and suddenly you’re in life’s gutter; a piece of dirty flotsam sitting on a rusty grate a wind’s-breath away from plunging into the sewer, leftover after the flood of life’s ill-fortune recedes. So no, I’m truly NOT saying that shirking responsibility is excusable … but I do say that I understand it. I understand it from a cognitive perspective at least. However, when I think of the situation in Spiritual terms, it becomes so much more tragic. Reading a novel about some poor person caught in one of life’s non-choices, or watching a movie about some disastrous result from the non-choice a person was forced to make, I can get away with evaluating the character’s morals and fortitude. After all, most of the time in those cases, the stories, choices and the characters are fictional; they have no value beyond the lesson or entertainment value of the book. We can afford to divorce the personal from the personality; the character from the character, so to speak. In real life though … we HAVE to see the spiritual situation in that person; a man or woman who chooses between a bad choice and an extra-bad choice is a spiritual being; a soul made in the image of God. For those whose choices all seem between bad and worse, I truly am heartbroken; I weep for those “who have no hope” (1Th 4:13). The precious spiritual potential of millions of lives is wasted as life trudges on in the land of least-worst. Those people are like a soldier in a Great War battle who has been told by his officers to go “over the top” of his trench and charge the enemy’s defenses. It’s unlikely he will survive the first spit of enemy gunfire, much less the second hail as he navigates the barbed wire … and his chance of making it through the no-man’s land is nil. He finds himself up to his hips in a sodden field. Each step he takes is energy-sapping and reduces him to exhaustion. Retreating or continuing on, turning to the right or to the left, all choices are hopeless. Frozen in place by the morass, he finally realizes that the options are limited in outcome: he can continue on in futility, hoping the bullet which hits him kills him quickly; he can turn to one side or another and possibly prolong the hopeless state for a moment or two more; or he can turn back and retreat, only to be shot for cowardice if he makes it back to his post. That’s it! Those are his choices. And those choices are hell. When Paul described those “who have no hope” he was making a logical argument about this very idea; an argument which goes from 1Th 4:1 all the way through 5:11. The passage starts in 4:1-12 with Paul describing how God’s sanctification of the believer should lead that believer to live a life in the body which shows love to others and which is “holy and honorable.” However, he couldn’t make this instruction without the message of hope that he places in 4:15-5:11. Those verses talk about the end of time; both the end of time for the life of the individual here on earth and the end of this painful, sinful epoch. With those endings come hope for the believer; hope that union with Christ in His death and burial will also bring about union with Him in the resurrection on the last day. 1Th 4:13 & 14 then sits at the fulcrum of Paul’s message because it tells us that there is a hopeful choice for the Christian. Here is verse 13 in its entirety: “Brothers and sisters, we do not want you to be uninformed about those who sleep in death, so that you do not grieve like the rest of mankind, who have no hope.” To put it another way, we have a different set of choices from the unbeliever – a set of choices which does not lead to death; a set of choices without a “least-worst” among them. After that fulcrum verse, Paul then starts his next sentence (v.4) with, “For we believe …” He wouldn’t make this statement unless he was beginning to justify the exhortations of the previous verses. “For we believe that Jesus died and rose again, and so we believe that God will bring with Jesus those who have fallen asleep” (v.14). The path of righteousness is suddenly revealed as the path of hope. We find ourselves stuck in the hip-deep mire in the no-man’s land of a spiritual war, every decision possible to us will lead to death. Despair begins to set in. Then, out of the black gloom, shines a light! It doesn’t change the physical situation; bullets are still flying about us, and every next step in whichever direction could still be onto a landmine. But it does indeed change the spiritual outlook. Whichever way we travel, whatever decision we make, we can’t go wrong because Christ cannot go wrong. Whether we are still alive in the end, or whether we have “fallen asleep” (as Paul puts it in v.15), does not matter because we will be “caught up to meet the Lord in the air” (v.17). One thing that I’ll add to the whole idea though: Paul’s passage in 1 Thessalonians 4 and 5 isn’t quite as linear as I make it out to be. By that I mean that it’s not a simple progression from righteous living to dying to being caught up to be with Jesus. I suppose that the simplicity of that progression would be nice. But the ramifications of it being like that are horrible because it puts the obligation on us to somehow transcend our hopeless situation in order to get the point where we can live righteously. However, the beauty of the story, and the source of the hope, is Jesus! He came, He lived, He died willingly, He conquered death, and HE GIVES salvation and sanctification to righteousness! Translation: He did what we could not, in order to make us what we aren’t, to then change our outlook, in order to give us HOPE. So we begin to realize that hope is a process, not an instantaneous flick of a switch from “hopeless” to “hopeful.” With that in mind, and though the message is already beautiful enough, we then have our hope bolstered all the more because we are told that Jesus meets us wherever we are in order to begin the process of hope (“[Jesus has] not come to call the righteous, but sinners to repentance” Lk 5:31), AND we are told that the Spirit will remain with us wherever we go in order to continue the process of giving hope (“we ourselves, who have the firstfruits of the Spirit, groan inwardly as we wait eagerly for our adoption to sonship, the redemption of our bodies” Rom 8:23). You see that, since hope is a process, God has to start it, Christ has to connect it, the Spirit has to continually renew it, and we – pitiful as our strength and mental acuity is – must re-dedicate ourselves to the source of our hope every moment of every day. We must glory in our weakness and use it to be humble before God. We must humble ourselves so that He may make us holy. We must be holy so that we may bring Him honor. And that honor just might be visible to other poor souls who are stuck in the mire of the battlefield like we are, but who are without hope. Maybe they will see that honor and gain courage too? Maybe they will see that holiness and God will prick their hearts? Maybe all that will be gained is God’s glory? But wouldn’t that alone be worthwhile? So the next time a friend says he wants to go to Long John Silver’s, remember that these “light and momentary troubles are achieving for us an eternal glory that far outweighs them all” and then go … even if you have to burn your clothes afterward. Or, more seriously, the next time a friend seems mired in a decision between bad and worse, “encourage [him] with these words”- the words of 1Th 4&5.